One of the most classic dishes of Louisiana, and of New Orleans, Jambalaya is a wonderful, irrepressible medley of rice, sausage, chicken, sometimes pork or seafood, and vegetables (including the “trinity” – onions, green peppers, and celery). It is one of the most loved dishes of the region and for very good reason. The folks at Zatarain’s, who know a thing or two about all things Creole and Cajun food, explain the history of jambalaya: Saffron was virtually impossible to come by in New Orleans in the 1780s, which meant Spanish colonists were unable to make their beloved paella. 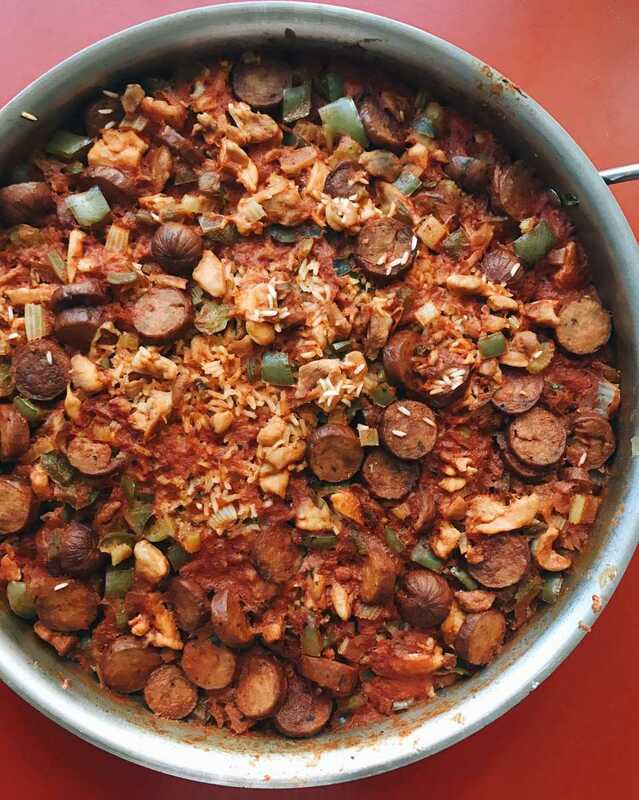 A mix of local seasonings was created, Andouille sausage evolved from sausages introduced to South Louisiana by German immigrants, chickens and seafood abounded, and so, jambalaya was created. The name comes from the Provencal word “jambalaia” meaning a mix or mashup, and reflects its unique blend of flavors. Creole seasoning and a healthy dose of cayenne pepper make this a dish that sits up front and center in your mouth, but you can tone down the seasonings as you wish. Sometimes the meats are browned and then removed from the pan, and added back into the mix later after the vegetables are sautéed and the rice and liquid have been added. This is a nice step when you have the time, but in this shortcut version we skip it, and no one will be the wiser. Heat the oil in a very large deep saucepan over medium high heat. Brown the sausage for about 5 minutes until browned. Add the chicken and continue to cook until the chicken is lightly browned, but not cooked through, about 5 more minutes. Add the onions, peppers, celery, scallions, and garlic and sauté for another 5 minutes, until the vegetables have started to soften. Stir in the rice, Creole seasoning, and cayenne pepper and stir until the rice is well coated with the mixture. Add the crushed tomatoes and broth and stir well. Bring the mixture to a simmer, then lower the heat to low, cover the pan, and keep at a gentle simmer for about 25 minutes until the rice is tender and the liquid has been absorbed. Stir well and serve hot.